THE DEPARTMENT OF Agriculture has confirmed that the first case of the killer tree disease ash dieback has been found in a native Irish hedgerow tree in Leitrim. 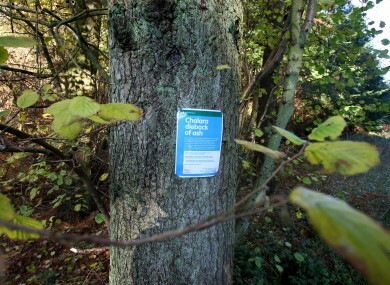 In October last year, the first case of the fungus, Chalara fraxinea, was identified in an area that had been planted with imported ash plants in 2009. Since then 96 cases of the fungus were identified in a major survey by the Department. This included systematic ash surveys of plantations, nurseries, roadsides, landscape and farm landscape plantings and hedgerows. Today the department said that another case of the disease was found in a hedgerow tree that is outside of the original plantation of imported plants in Co Leitrim. Speaking today, Minister of State at the Department of Agriculture, Food and the Marine Tom Hayes said he was “fully aware of the significance of these findings” and has asked officials to put a comprehensive eradication plan into place immediately which will start from today. There has been a massive effort to survey for this disease and remove the disease anywhere it has presented itself. We will continue this policy of eradication and will keep the policy under constant review as results come in from the surveys. He added that the department has discussed the latest findings with counterparts in Northern Ireland as there is an all-Ireland strategy in place to deal with the disease. Email “First case of killer tree disease found in native Irish hedgerow”. Feedback on “First case of killer tree disease found in native Irish hedgerow”.